What a short, strange, stock market trip it's been. Who would have thought back in the dark days of the March lows that 2009 would end up being an outstanding year for equities? It may not feel like it, but the blue-chip Dow Jones Industrial Average ($INDU) just enjoyed its best annual gain since 2003, when it rose 25%.%%DynaPub-Enhancement class="enhancement contentType-HTML Content fragmentId-1 payloadId-61603 alignment-right size-small"%% The Dow finished the year up nearly 20%, while the broader S&P 500 ($INX) gained almost 25%. As for the tech-heavy Nasdaq Composite ($COMPX), risk-chasing investors looking to make up for last year's rout pushed it up an astonishing nearly 45% this year. Consider that over long periods of time stocks return an average of about 10% a year and 2009 was astonishingly good to investors by any reckoning. The best-performing sectors were tech and materials, with gains of more than 60% and 50%, respectively, according to Capital IQ. That's partly a reflection of how badly beaten down those sectors were coming out of last year, and partly because they comprise early-cycle stocks, meaning they tend to move well ahead of an economic recovery. The biggest laggards were telecommunications, which gained 5%, and utilities, which added about 10%. No surprise there, as investors dumped poky, defensive, dividend-payers in order to wrap their arms around risk and its attendant rewards. Drilling down into individual names, the top-performing U.S. stock of 2009 was Diedrich Coffee (DDRX). Now in the process of being acquired by Peet's Coffee (PEET), Diedrich shares soared nearly 9,600% this year. (It was the best stock in the Nasdaq Composite, too). 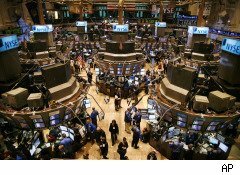 The top Dow stock was American Express (AXP), which rose 120%, while the XL Capital (XL) led the S&P 500 with a 398% gain. As salutary as 2009 was for U.S. equity investors, it did little to make up for a decade of buy-and-hold misery. Indeed, the last 10 years the ignoble distinction of being the Worst Decade Ever for stocks. Thanks to a couple of mighty assets bubbles -- first in tech stocks and then in credit -- the 2000s turned out to be even more horrid than the Stagflation 70s or, gulp, Great Depression 30s. That's right: The S&P 500 produced an annualized, inflation-adjusted "return" of -3.3% over the last decade, according to Charles Jones, a finance professor at North Carolina State University. That's not to say there wasn't huge money to be made in equities -- if you knew where to look. True, the following is like going back in time with the winning Mega Millions numbers, but we decided to construct the perfect concentrated portfolio for the last 10 years, helped by the Center for Research in Securities Prices at the University of Chicago Booth School of Business. If you bought these 10 names on the last trading day of 1999 and reinvested all the dividends, you would have enjoyed an average total return of . . . wait for it . . . 5,029%.